Made of elegant designed heavy brocade fabric, this challah cover presents the yearning to the Judaism’s holiest site and the rebuilding of the Land of Israel. The challah cover has a colorful image of the Kotel HaMa'aravi, the Western Wall, in the center. Situated in a stone arch with two towers with flames on each side, the design is emphasizes the desire for the redemption and return to the Holy Land. 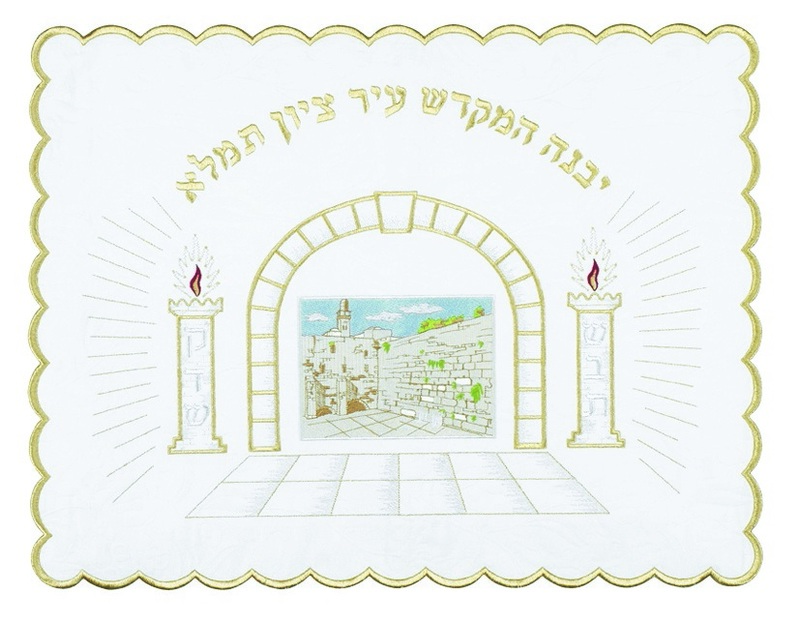 The Hebrew words “Yibaneh hamikdash, ir Tzion temalei”, which mean “May the Temple be rebuilt, the City of Zion replenished”, are embroidered in gold colored thread across the top. The edges are trimmed with gold thread in a scalloped design.